“Please don’t switch seats,” Neil Henderson says—whole in jest, half in earnest—to an assembled crowd at North Arm Farm in Pemberton. “I don’t have extra chairs!” The restaurant director at Araxi and Bar Oso is welcoming guests to the Araxi Restaurant + Oyster Bar’s eighth annual longtable dinner, saying a few words among the passed hors d’oeuvres (barbecued figs wrapped in balsamic guanciale, citrus cucumber bites filled with whipped goat cheese) and drinks (LaStella pinot grigio, Sheringham Distillery Seaside Gin). 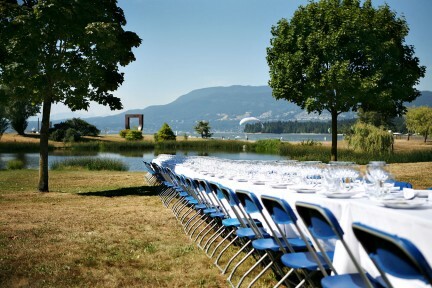 While last year’s festivities played host to 275 people, 2018’s has a whopping 400—so it is understandable how even a few people swapping chairs could throw the whole 400-foot table out of its perfectly symmetrical harmony. 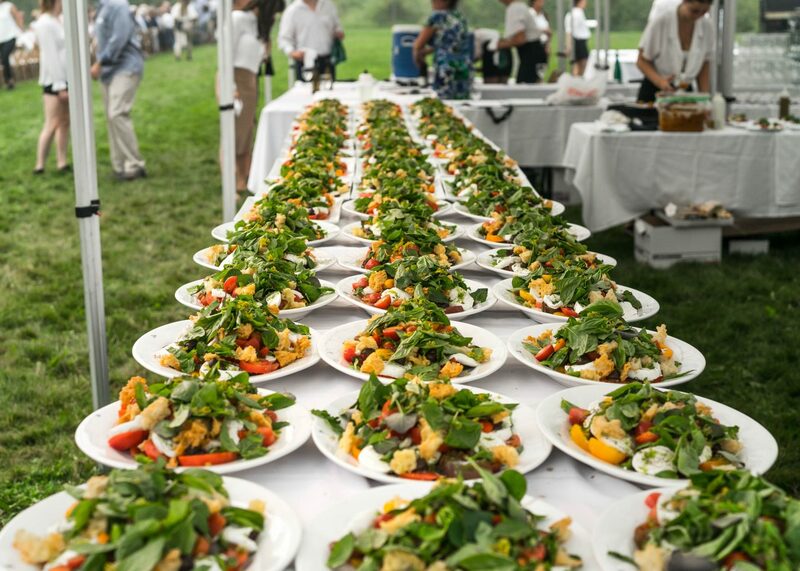 It’s quite a feat to throw an event for so many diners, especially when the bar of excellence is set this high. 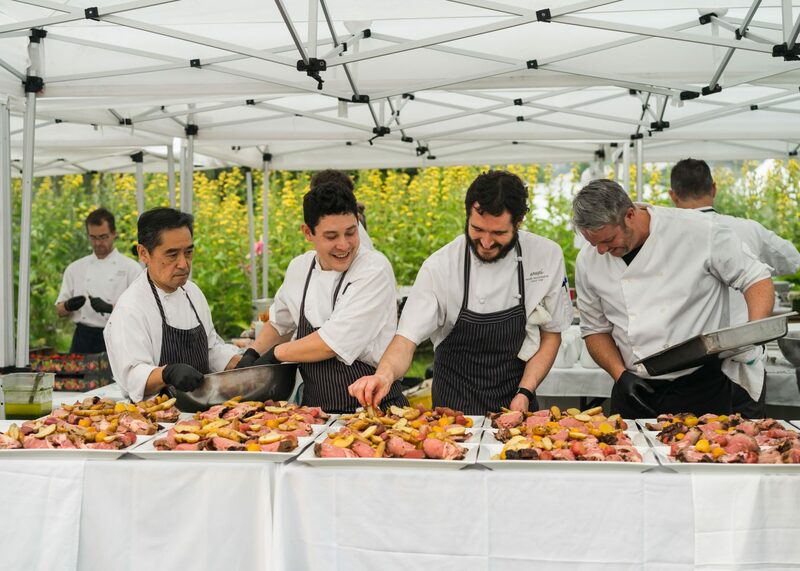 Regular meals at Araxi in Whistler Village are executed to perfection, but this is a massive feast served in a field, with little reprieve from the August day’s heat or the heartbreaking B.C. wildfire smoke. After watching the team work precisely and quickly under tents set up onsite, though, it is evident they know exactly what they’re doing. 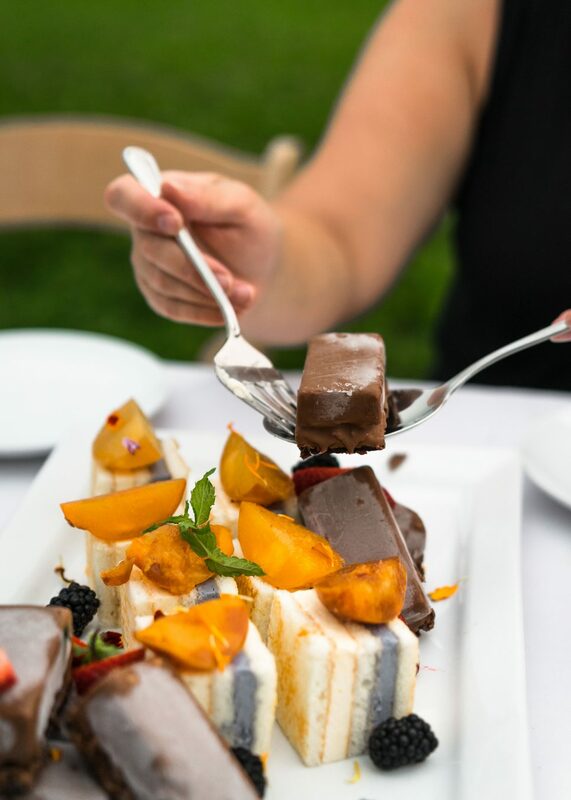 Every aspect of the evening, from the food to the service, is seamless. 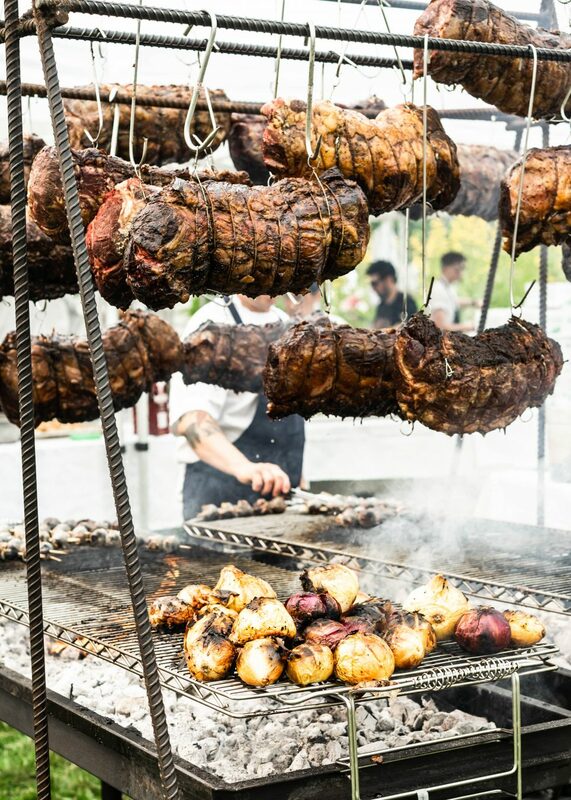 “This is meant to be a laidback dinner among friends,” Henderson says. 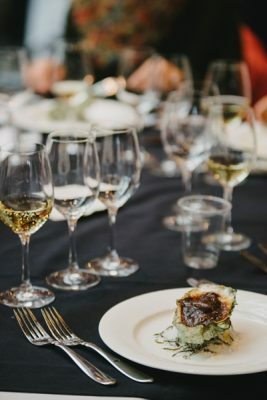 “You don’t change cutlery, you don’t change plates very often.” Because the Vancouver-based Toptable group operates three restaurants in Whistler, the dinner (once prepared solely by Araxi) is now also comprised of the teams from Italian eatery Il Caminetto and the Spanish-focused Bar Oso. 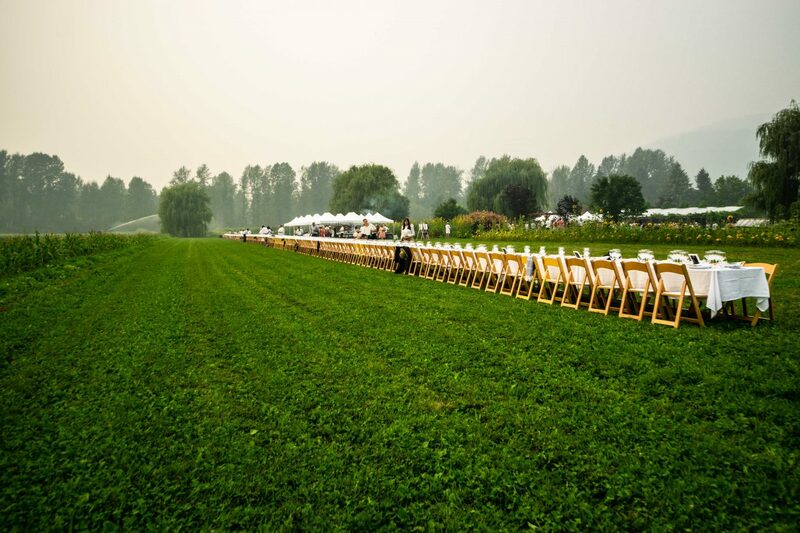 As such, for the second year, each restaurant gets its own designated course. 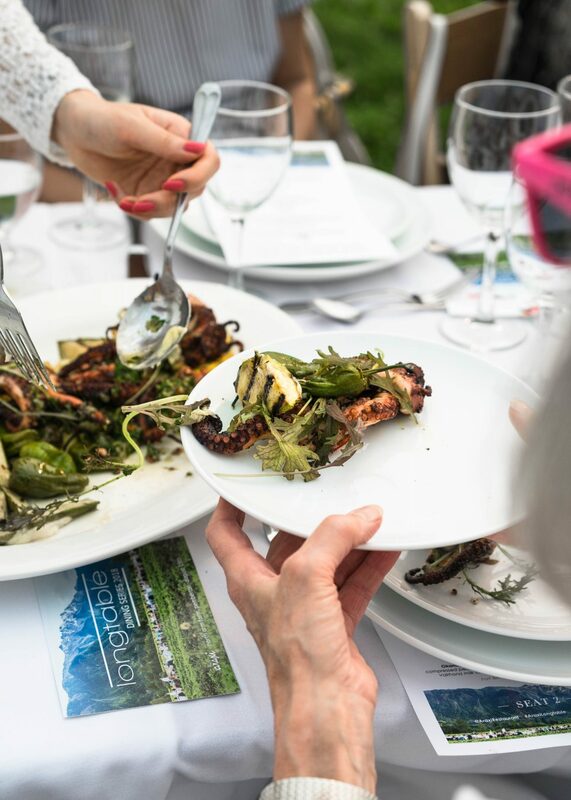 It begins with Bar Oso’s slow-cooked and charred trap-caught octopus with grilled summer squash, Pemberton padron peppers roasted in extra virgin olive oil and sea salt, ruby streak salad, and aioli sauce. The octopus is tender (easier said than done), the squash fresh and juicy. 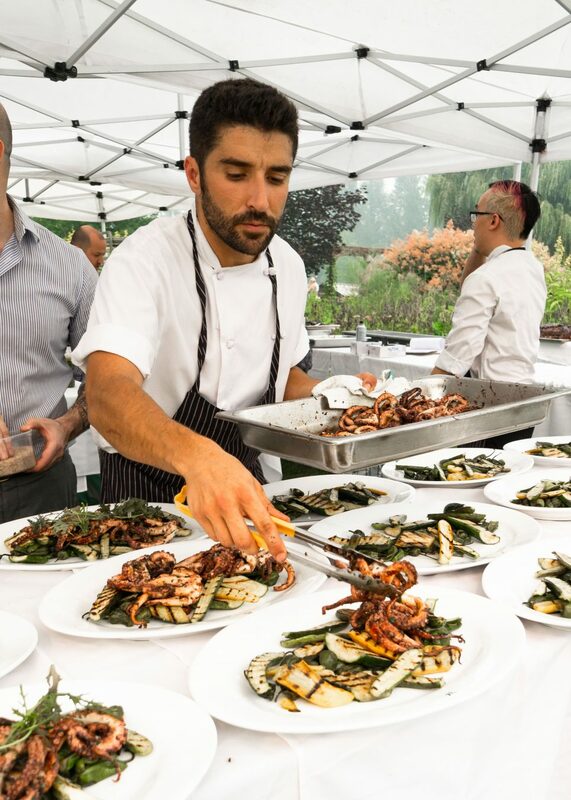 Paired with Quails’ Gate Estate Chardonnay, the charring of the octopus and vegetables begins to sing. 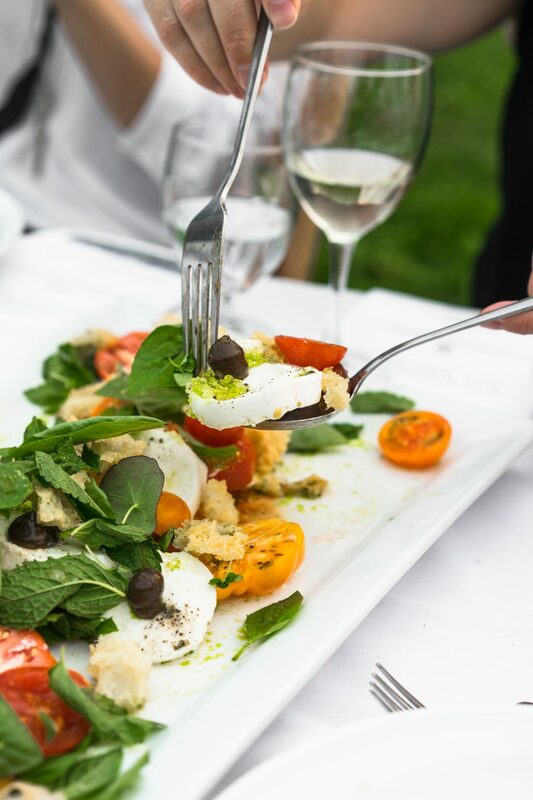 Next comes an Instagram-worthy spread from Il Caminetto of local heirloom tomatoes with buffalo mozzarella, balsamic jam, torn focaccia, and basil and mint picked right from North Arm Farm’s nearby rows. 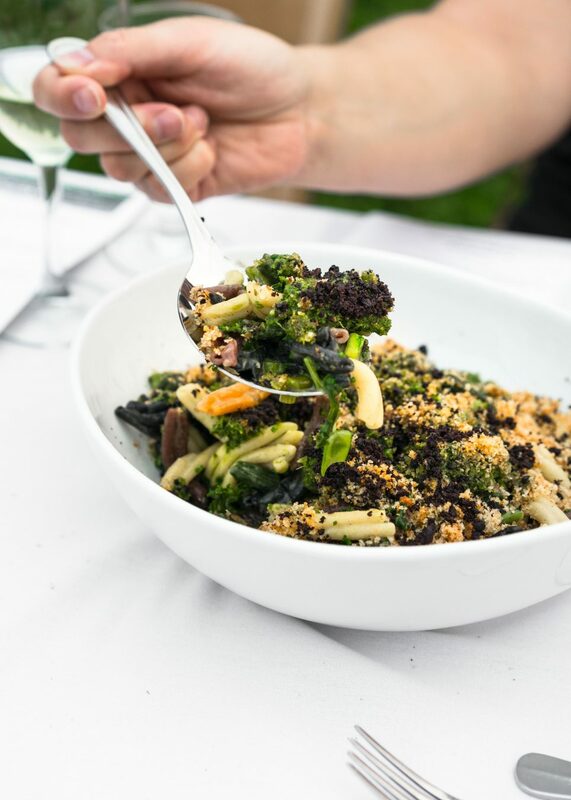 Italians go big before they go home, so this course also includes fresh house-made Casarecce pasta coloured and flavoured with North Arm Farm vegetables and served with fresh herbs, smoked butter sauce, and toasted bread crumbs. 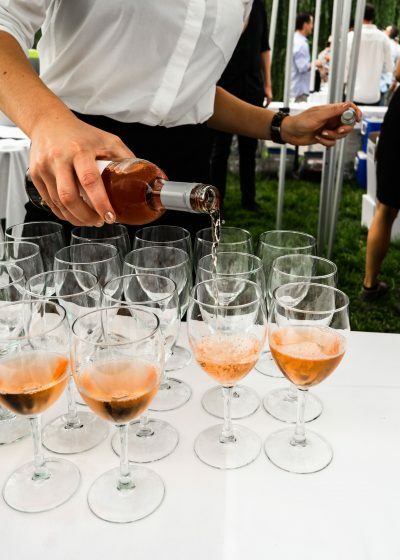 It is best enjoyed between sips of crisp Vaila Rosé from Le Vieux Pin, the freshness of the tomatoes and warmth of the pasta creating delicious balance. 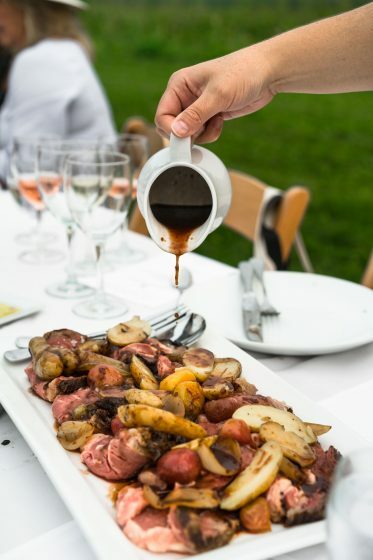 To finish, Araxi presents fire-roasted Double R Ranch prime ribeye glazed with rosemary and balsamic, along with glazed beets and showstopping North Arm Farm onions roasted in the embers, plus olive oil-poached potatoes and candied shallot and thyme jus. Burrowing Owl comes to play here with a sharp cabernet franc that cuts through the decadence of this beautiful, succulent meat dish. Araxi is helmed by renowned executive chef James Walt, although on this particular day he is notably absent due to an injury (“But we have James’s parents here tonight, and that’s almost better,” Henderson jokes to the crowd). 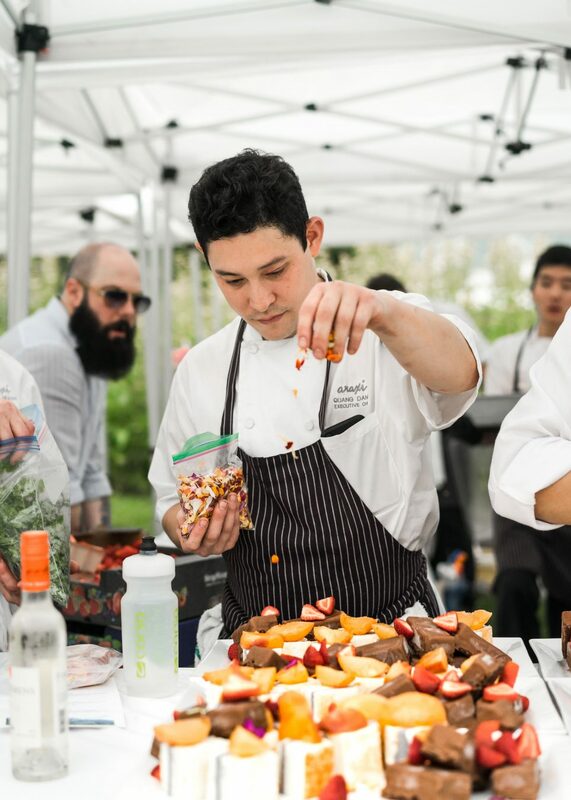 The Araxi course still goes off without a hitch, thanks in particular to the leadership of second executive chef Quang Dang, who joined the team from West Restaurant in Vancouver. Prior to service, he could be spotted standing on a plastic crate and using a brush to gently baste the arresting display of hanging meat. For dessert, Araxi’s private dining space The Cellar serves up Okanagan peach cake with compressed peaches, lemon chiffon, and white chocolate mouse, plus the perfectly adult version of an ice cream bar with Valrhona milk chocolate ice cream, a crisp chocolate crust, and a milk chocolate coating. 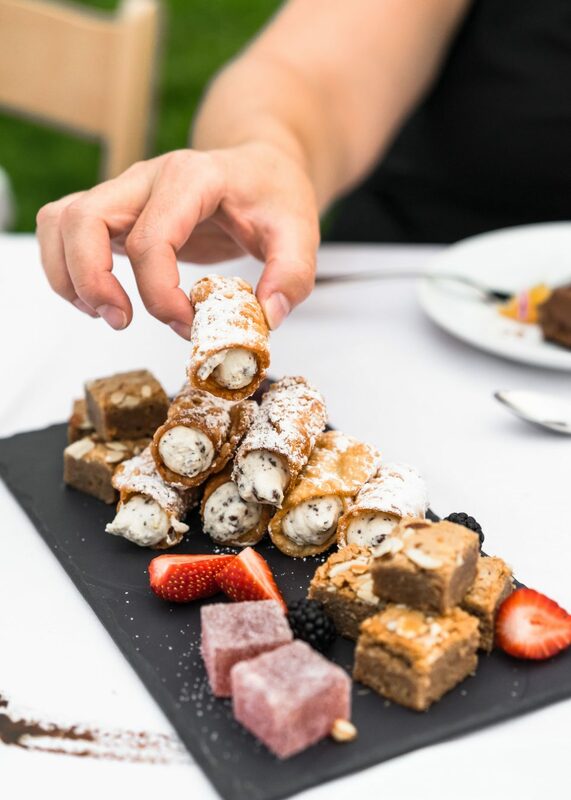 Things don’t end there, either, as plates of cannoli, blondies, and jellies are placed in front of smiling guests as they sip Fort Berens Late Harvest Riesling. 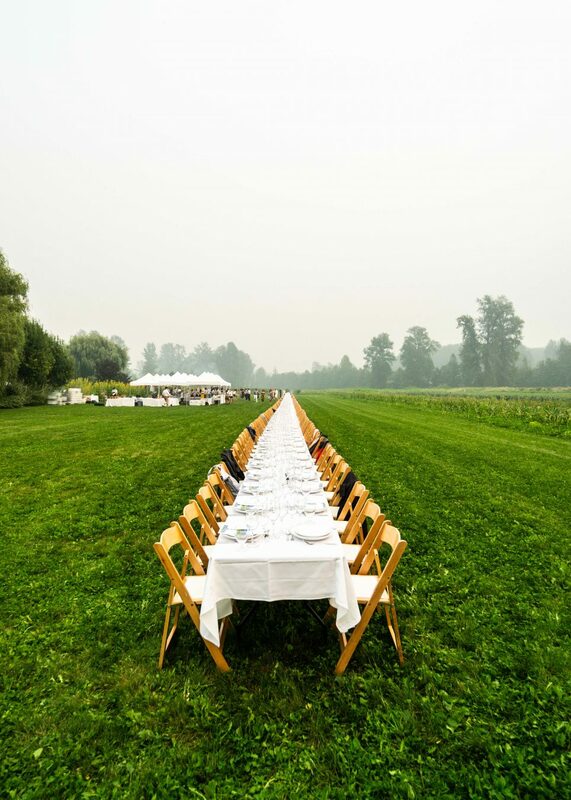 In a true celebration of the province’s produce, the longtable dinner is a hallmark event of the summer season. 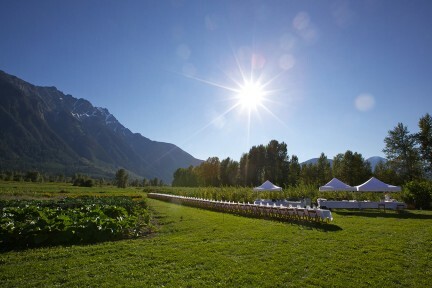 Representing everything that Araxi and the other Toptable restaurants stand for, it combines impeccable food, attentive service, and fresh ingredients in a truly unforgettable setting (though this year, the aforementioned smoke makes it hard to see beyond the idyllic rows of crops). 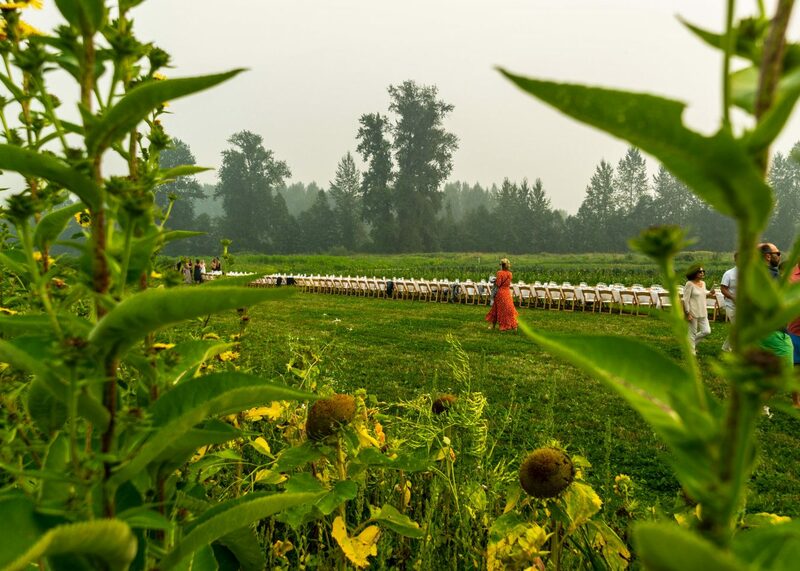 From adoring locals who clearly come every year to proud parents who travel from out of town (Quang Dang’s drove from Calgary just to attend), it is a not-to-miss, albeit extravagant, garden party. Things wrap up at a completely civilized hour, making the trek back to Vancouver entirely possible post-dinner—but staying in Whistler (about a 35-minute drive from Pemberton) is a sure way to make the most of the experience. 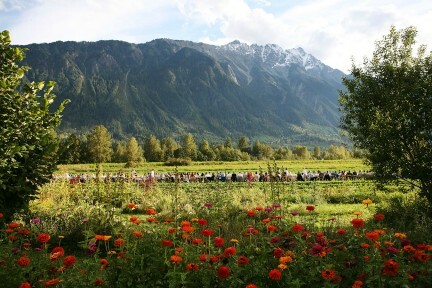 At the Four Seasons Resort Whistler, located in the Upper Village, luxury awaits come nightfall. Indulge in an evening swim and soak at the outdoor pool complex (perhaps making friends with another couple who came up for the longtable), then head to Sidecut Modern Steak+Bar for a leisurely nightcap. With an original list of cocktails made by the restaurant’s bar staff members, there is plenty to choose from, including the Bourberry; inspired by the mint julep, the refreshing mix incorporates Tincup Bourbon, Chambord, muddled mint, and blackberry and lime juice. If it’s warm past sundown, enjoy drinks outside on the terrace, where an adorable camper-bar has been set up, complete with its own beer taps and nearby comfy bench seating below trendy string lights. Sleep will come quick after the day’s festivities, but Four Seasons king beds make the transition easier still, and waking to views of the lush forest are sure to ease the morning’s call back to reality. Down at Sidecut once again, refuel with a power acai bowl with cashews and cacao nibs or toast topped with tangy guacamole, poached eggs, baby kale, and hemp hearts. 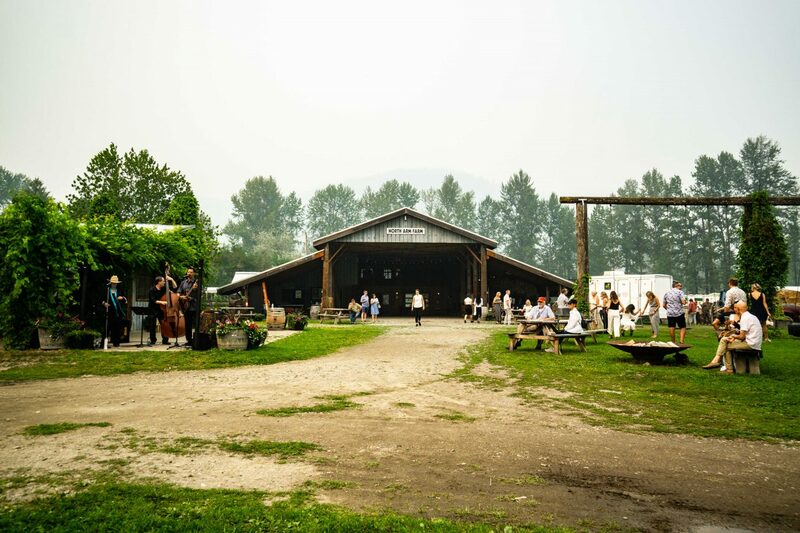 Those who want to linger in the mountains can find refuge in the craft beer selection of Handlebar, the mouth-watering pastries of Purebread, and the rejuvenating pools of Scandinave Spa. Or thrills can be discovered at the new jaw-dropping Cloudraker footbridge suspended high above Whistler Bowl. Best to save some of those activities for next year, though; it’s difficult to believe anyone would opt not to come back for another chance to break such special bread. Find a beverage and a bite.